With a small budget and big ideas, guerrilla marketing toys with the conventional to create impressionable advertising. Its creative approach to selling products often surprises consumers, making campaigns just as unforgettable as they are effective. Here are five guerrilla marketing campaigns that have seared their way into our memories over the years. Donning white bonnets and red robes, handsmaids were spotted all over the streets of Sydney to promote the release of the dystopian series Handsmaid’s Tale on SBS On Demand last year. The campaign had commuters sharing photos of the handmaids to social media, equal parts terrified and intrigued by their cult-like dress. If you thought that placing handsmaids throughout the streets of Sydney was dark, let us remind you of the IT campaign. The horror movie, based on the Stephen King novel, was blamed for the introduction of thousands of sadistic clowns to our neighbours, some threatening onlookers with knives and baseball bats. The clown copycats weren’t affiliated in any way with the movie. However, it seems the marketing team did their job almost too well by inspiring wannabes with their placement of red balloons throughout the city. Tied to drainpipes were creepy balloons and the message “it’s closer than you think” sprayed on the streets. The PR team also hired street artists to paint interpretations of Pennywise the clown on walls in Sydney, Melbourne and Brisbane. Thanks to clever advertising creating hype around the movie, IT pulled in a worldwide total of US$700 million (AUD$943.67 million) at the box office. In what some called a “cruel stunt”, Tic Tac France enlisted a flash mob to humiliate confused pedestrians, playing on the universal anxiety of having bad breath. During the stunt, an actor would ask pedestrians for directions, causing a crowd of onlookers to collapse from the odour of their breath. When the innocent bystander finally accepted a Tic Tac, the crowd would rise to their feet to cheer. It was only then that the pedestrian would realise they’d been duped by advertisers. The video made for a heartless but effective marketing campaign. And despite its mean slant, the theatrics of the video make it an exemplary piece of guerrilla marketing. In the developed world, accessing water is as simple as entering coins into a machine and pressing a button. But for the tens of thousands entrenched in poverty, collecting water is an arduous task that takes hours. 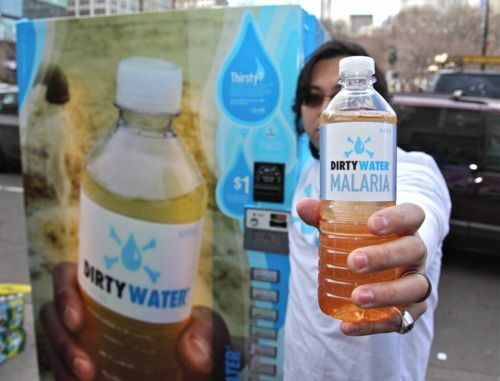 Even then, the water that is available is often contaminated, causing serious sickness. To show this disparity, UNICEF bottled dirty water and sold them from vending machines in the bustling streets of New York. Through their ingenuity, the organisation gave the public a firsthand look at the struggles many confront worldwide with devastated and polluted water sources. For a dollar a pop, they offered eight flavours of disease, including typhoid, malaria, cholera and hepatitis. The $1USD charge was enough to provide a child safe cleaning water for 40 days, they claimed. Volkswagen made the days of hundreds of shoppers when they installed a giant red slide into a shopping centre, labelling it the ‘fast lane’. Taking the slide was a fun alternative to walking down the escalator, and was much faster too. Volkswagen captured a video that instantly went viral, thanks to the elation of shoppers taking the slide. The happiness in the video is contagious, but the real genius of the campaign was that it got consumers to link feelings of wonder, fun and happiness to the Volkswagen brand. The ‘fast lane’ worked because, for many adults, it was a nostalgic reminder of childhood, reminding them of bygone afternoons at the playground. DIY social media marketing: Can you, and should you?